Ethiopians go to the polls on 23 May to elect a new parliament. The previous elections in 2005 were marred by allegations of government vote-rigging, and scores of people died in post-poll violence. Voters will elect the 547 members of the lower House of People's Representatives directly, and choose regional councillors who will in turn elect the upper House of Federation. All Ethiopian citizens over the age of 18 can vote, and 32 million have registered to do so out of an overall population of 86 million. About 26 million people registered to vote in 2005. Voting for the lower house is by the first-past-the-post system, with the candidate who wins the most votes being elected. Final results are expected on 21 June - similar time periods have led opposition parties to allege vote-rigging in the past. The key policy differences between the governing Ethiopian People's Revolutionary Democratic Front (EPRDF) and the various opposition parties range from the focus of economic development to fraught relations with neighbouring Eritrea. The government's alliance with the United States in its "war on terror" led to Ethiopian military intervention in Somalia in 2006, and the other parties on the whole oppose this foreign policy alignment. The main issue in the election, however, is likely to be the manner in which the poll itself is conducted. The opposition and many international media and rights organisations have objected to regulations governing the behaviour of the media and election observers. The opposition has also made allegations of violence and intimidation of candidates. The main opposition groups in 2005, the Coalition for Unity and Democracy (CUD) and the United Ethiopian Democratic Forces, believed they were faring well in the elections, and their supporters took to the streets when the eventual election results produced an EPRDF win. Some opposition MPs refused to take their seats, protests were broken up with considerable violence, scores of people died, and some opposition leaders were arrested on charges of seeking to overthrow the constitutional system. Which major parties are standing? The Ethiopian People's Revolutionary Democratic Front. The EPRDF, which has run Ethiopia since ousting the communist regime of Mengistu Haile Mariam in 1991, has won all three previous parliamentary elections. The EPRDF leader and longstanding prime minister, Meles Zenawi, received the party's endorsement as leader for another five years in October 2009. The EPRDF is a coalition of several basically ethnic-based parties, the main four being Mr Meles's Tigray People's Liberation Front, the Amhara National Democratic Movement, the Oromo People's Democratic Organisation and the South Ethiopia People's Democratic Movement. In 2005 the EPRDF won 327 out of the 547 seats in the lower house, down from 479 in the 2000 elections. It campaigns on its record in office, highlighting its agricultural policy, boost to growth and provision of health and education services. 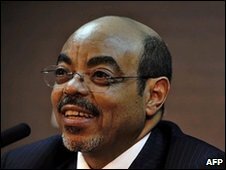 Mr Meles said in March that there would be no repeat of the election violence this time. The Paris-based Indian Ocean Newsletter said this was because the EPRDF was exercising tight control over the media, independent organisations and the security forces during the election campaign. Medrek. The Ethiopian Federal Democratic Forum (Medrek is "forum" in Amharic) is a coalition of eight main parties, some ethnic-based, of which the strongest is probably the United Ethiopian Democratic Forces (UEDF), which came third in the 2005 elections. Merera Gudina is the Medrek chairman. It opposes the government's focus on agriculture as the driving force in the economy, calling for greater development of industry and services. It says it will grant farmers the right to own land, which is all held by the state at present. It also opposes the agreement with Eritrea on border delineation, and says it will use legal and diplomatic means to recover the border town of Badme and access to the Eritrean port of Assab. Medrek has won the support of several prominent opposition leaders, as well as former government supporters such as ex-President Negaso Gidada and ex-defence minister Siye Abraha. The All Ethiopian Unity Organisation (AEUO) is led by Hailu Shawl, a prominent figure in the previous CUD opposition coalition. It is campaigning for the release of CUD prisoners still in prison since the 2005 violence. It boycotted TV debates in February, alleging that the EPRDF was getting more air time than it deserved and the debates were not been conducted fairly. The Ethiopian Democratic Party is also standing. It has poor relations with Medrek, and was the only opposition party to support the intervention in Somalia in 2006. What has media coverage been like? All parties have agreed to an Election Code of Conduct to avoid the controversies of 2005 as much as possible. This allocates time on the broadcast media, but all opposition parties have complained that the governing EPRDF has received more than its fair share. The opposition AEUO boycotted televised debates in protest. The EPRDF share of broadcast time is 42-43% on state TV and radio, compared to 37-39% for all the opposition parties combined. The National Electoral Board of Ethiopia announced a draft media code in March that barred interviews on polling day, opinion polls prior to the announcement of the official election results, and any reporting that might incite violence. The Ethiopian National Journalists' Union denounced the last provision of the draft as unclear, saying it left reporters fearful that the government could use it in an "arbitrary manner". In turn the Electoral Board said it had asked media organisations to submit suggestions for the draft, but had received nothing by mid-April. The government acknowledged in March that it was jamming the Voice of America Amharic Service, with Prime Minister Meles accusing the broadcaster of "propaganda to destabilise the country". The International Federation of Journalists and the International Press Institute have described the media environment as "tightly controlled" and "under pressure". Are there any election observers? The government has invited foreign observers, but requires them to follow a code that prohibits the use of recording equipment or commenting on the election process while it is under way. Local election observers must "prove their independence" as part of the registration process, according to the Ethiopian Reporter newspaper. Both the European Union and African Union have agreed to send missions, the former 200-strong, but the independent Carter Center declined an invitation to observe. A group of Ethiopian civic organisations formed the Kasahun Folo observer mission, saying it would deploy 40,000 monitors nationwide. The election campaign has been relatively peaceful, but opposition parties allege government harassment of candidates in Tigray and Oromiya regions in particular. The most serious incident was the stabbing to death of a Medrek candidate in Tigray in March. The government said he died in a "bar brawl" and accused the opposition of trying to bring the elections into disrepute. Both sides have used strong language in their campaigns. The government has portrayed the opposition as a "Trojan horse" for neighbouring Eritrea and of seeking to undermine democratic achievements. The opposition has described the EPRDF, and in particular Mr Meles's Tigray People's Liberation Front, of harassing their candidates and seeking to steal the election through vote-rigging. Most observers expect the EPRDF to win once again. The question is whether the opposition will accept the result, and whether controversy might lead to violence as it did in 2005.